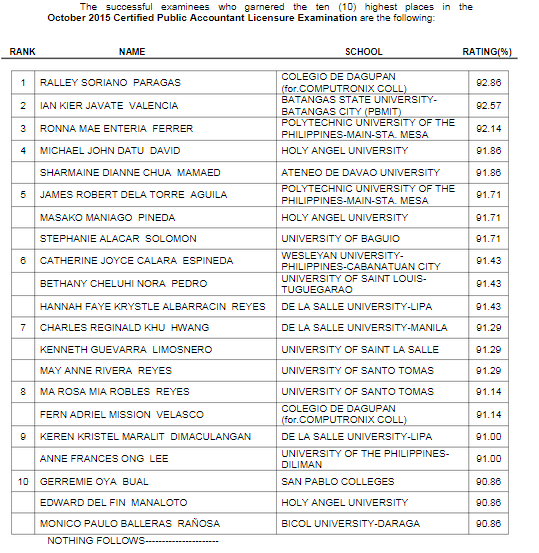 The Professional Regulation Commission (PRC) officially announced on Friday morning, October 16 the full list of passers for October 2015 Certified Public Accountant (CPA) board exam. Ralley Soriano Paragas, alumnus of Colegio de Dagupan (for. Computronix College) topped the board with 92.86 percent grade. Ian Kier Javate Valencia of Batangas State University (BatSU) ranked second with 92.57 percent rating. Polytechnic University of the Philippines (PUP) - Sta. Mesa, Holy Angel University (HAU), Ateneo de Davao (ADU) and University of Baguio (UB) graduates complete the top 5. PRC named a total of 5,468 out of 13,317 who passed the Certified Public Accountant Licensure Examination.